ROEMHELD has developed a wedge clamp specifically for the fixing of upper dies which meets the highest of safety requirements. An additional locking cylinder with bolt holds the wedge clamp in position and prevents any inadvertent retraction. As the ROEMHELD wedge clamps are constructed as a variant system, they can be flexibly adjusted in accordance with respective customer requirements. The standard range already includes seven designs with clamping forces of 25 to 630 kN and cylinder dimensions of between 25 and 125 mm. Clamping strokes of 15 to 36 mm are available here, and the maximum operating pressure is 350 bar respectively. If the elements are to be used for processes with high heat requirements, special designs are also available which are temperature-resistant up to 300 °C. 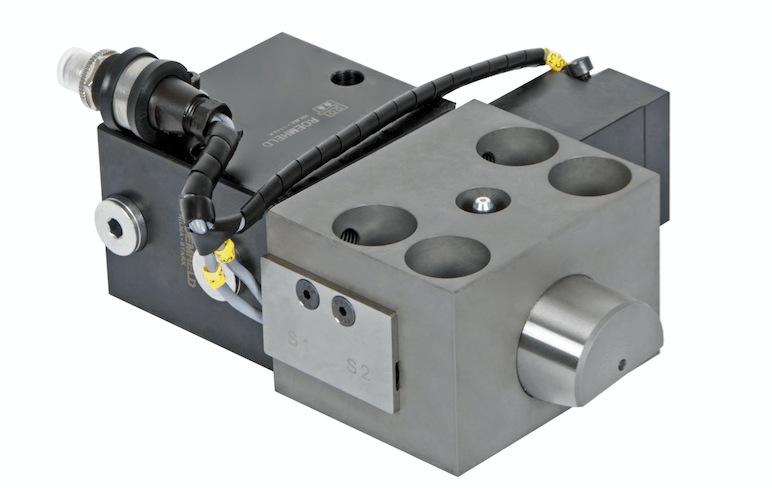 In addition, there are also versions for straight clamping edges, as well as models with clamping forces of up to 1250 kN and even higher retention forces. Further options include a special permanent lubrication and multi-layer, high-tech coatings for the clamping bolt and the housing which have a positive influence on the wear properties. With its extensive range of quick die clamping technology, the setup time optimiser ROEMHELD can complete virtually any clamping technology task in sheet forming, plastic and rubber processing. The magnetic, hydraulic and electromechanical clamping systems are versatile in use and help to make the processes of single and series production in virtually every industry more efficient and economical. Products for changing dies, including die changing carts, roller bars and powered carrying consoles complete the range. Innovation through tradition: ROEMHELD was established in 1707 with a foundry in Friedrichshütte, which still belongs to the ROEMHELD Group today and counts as one of the oldest active industrial businesses in Germany. The owner-managed group of companies employs approximately 560 workers in its three locations of Laubach, Hilchenbach and Rankweil/Austria, and is represented in over 50 countries by service and sales organisations. With customers from the mechanical engineering sector, as well as the automobile, aviation and agricultural industries, the ROEMHELD Group generates an annual turnover of more than 100 million Euro.